I have long been a fan of services that offer low-cost investing products, such as DRIPS (Dividend Reinvestment Plans). Some companies even offer their employees a plan to purchase company stock without fees. For a time, there was even Sharebuilder (now Capital One Investing), which allowed for purchasing stock for fixed fees per month. But now, Robinhood has come onto the stage. As great as the options I mentioned are, they have limitations. DRIPs, for example, typically limit you to one stock. You then have to shop around to other companies and set up other accounts there. It's not a giant hassle; but, it's a hassle. I liked Sharebuilder too; but, there was still some cost involved. I found myself having to accumulate my deposits to buy stocks in batches in order to reduce my cost. This is all outside of retirement plans such as 401ks, SEPs, and IRAs. Those typically allow you to purchase fractional shares, add regular amounts of money, and automatically dollar cost average, for a hefty load by the mutual funds and the plan administrators. In other words, the free options were a pain. The easy options were heavy on fees. Recently, with the launch of Robinhood, an iOS app that lets you buy and sell stock with no transaction fees, I'm excited to start investing again. Having no transaction fees makes it easy to buy single shares rather than waiting until you have a few hundred dollars saved up to make the commission a small percentage of the cost. The advantage of Robinhood is that you an start earning on your investment immediately rather than every few weeks or days when you save up enough money to buy a batch. Your only limit is the cost of the stock. Prior to Robinhood, I was a big fan of Loyal3. No, let me rephrase that. I still like Loyal3 even though it has limits to what you can buy. I like that Loyal3 lets me get in on IPOs and allows me to buy fractional shares. But, they do not offer a wide selection of stocks. On the other hand, the stocks they do offer are pretty good ones. I am happy to continue buying them through Loyal3. If you can only stash $10, you can buy $10 dollars worth of stock. That's cool. Robinhood, on the other hand, gives you the whole market to buy. If you are looking at a $100 stock but can only stash $50, then you'll have to wait until you deposit some more. But, at least you can buy the one share if that's all you can squeeze. What social media did for news and entertainment, Robinhood is doing for investors. 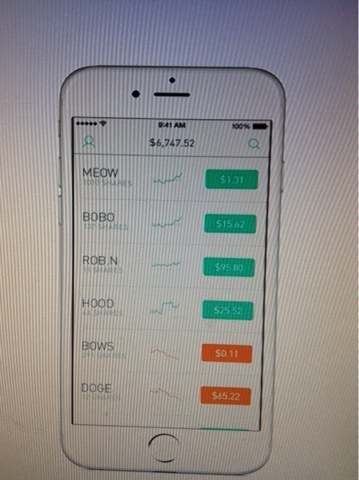 Robinhood brings down the scale of the market to give the little guy a shot at making some returns. I don't think we'll see day traders rocking Robinhood. These guys have computers with multiple monitors and super fast Internet connections. Robinhood only works on iOS. In this respect, Robinhood is to discount brokers what blogs are to big news organizations. Yes, you can succeed, but there is a big difference in scale. I have just begun on my Robinhood adventure. I'm hunting for dividends.